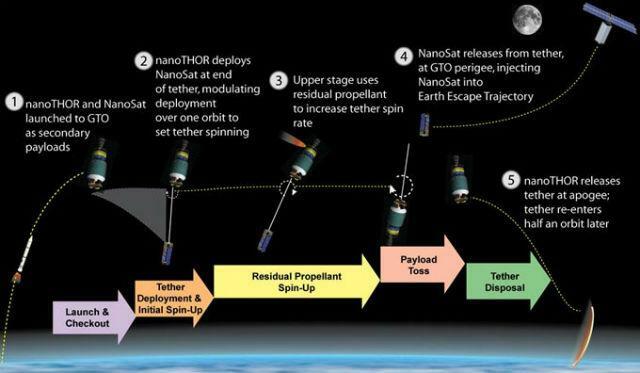 NASA has awarded $100,000 to Tethers Unlimited to develop its “Nanosatellite Tethered High-Orbit Release” (NanoTHOR) module. NanoTHOR, whose name derives from the Norse god Thor’s thrown hammer, would enable multiple nanosatellites to be carried as secondary payloads on upper stages launched into GTO to be injected into Earth-escape trajectories by scavenging orbital momentum and propellant from the upper stage. It utilizes a lightweight, re-usable tether to transfer momentum from the rocket stage to the nanosatellite. The use of a rotating tether “multiplies” the rocket’s delta-V by the mass ratio of the stage to the nanosat, enabling it to provide both very-high specific impulse propulsion competitive with the best EP thrusters and short transfer times competitive with chemical rockets. The tether also enables the stage’s orbital momentum to be converted to tether rotational momentum to increase the nanosat toss velocity.